The Wood Workshop is a happy place. The smell of sawdust is everywhere, and even on rainy days the place feels warm and quietly busy. It has existed for many decades, and has this special somethinig about it, thanks to work masters such as Michael Reinardy, Stefan Popoff, Pierre Spiegelberg and so many others that have left their footprints there, as well as a myriad of ideas and loving care. Our current core team consists of 9 wood workers who are residents here at Clanabogan, one colleague that comes on a day care basis, and we have had one work placement per year from Arvalee school. The work coordinator makes sure that the operation runs smoothly - which it would not without our young volunteers who assist our colleagues and artists at their work. Each individual has his or her own realm of talents that can be explored in this space. Whether it is rasping, cutting, carving, sanding, oiling or waxing wood, we know that we work as a team to produce unique, high quality art and a wide range of products. Our aim is not to produce en masse, but to take care of each item we create, embracing each person's talent and creativity. Please feel free to visit us during work hours, preferribly weekdays between 10 am and 12 pm or between 3-5 pm. For out of hour arrangements please contact us through the office. Most of our products are for sale, and the fact that you can meet the maker makes a visit even more interesting! We also work on a comission basis. 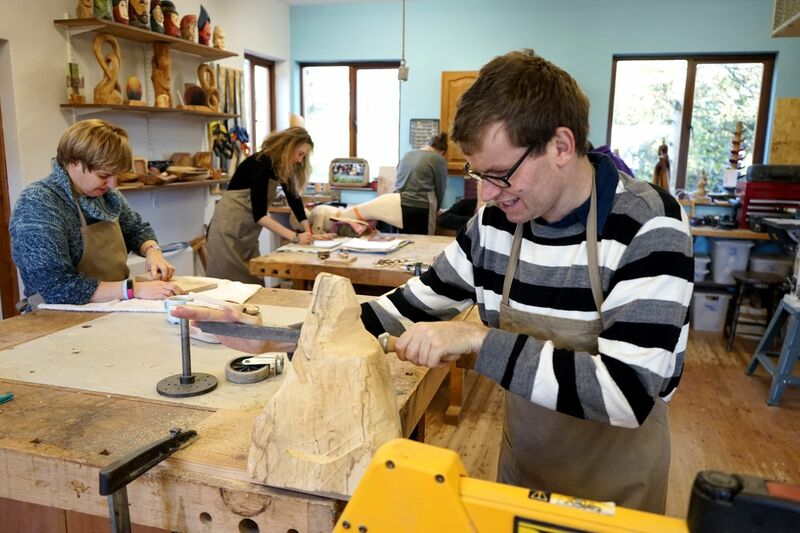 Each woodworker, artists and volunteers alike, also has the opportunity to take part in a QCF (Qualifications and Credit Framework Levels 1-3) in creative crafts in a number of different disciplines. Please look at http://www.rewardinglearning.org.uk/microsites/creative_crafts/ for more information in this qualification. We arrived here in 2016, and I jumped into the deep end taking over the wood workshop from Pierre. What a change! After 15 years in Spain, working as a freelancer in front of a computer screen, here I was - dealing with a very special team of colleagues and learning how to carve sculptures (they don't teach that where I learnt my trade!). Although a lot of my time is taken up by required paperwork and Health and Safety this-and-that, I am surrounded by fantastic people with great skills and ideas. Wood is such a beautiful material to work with - how could you not love it?